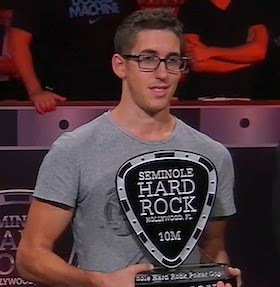 So Dan Colman tops that 1,499-entry field at the $5,300 Seminole Hard Rock Poker Open Main Event last night to be awarded a $1,446,710 first prize and thus take the biggest chunk of anyone from that $10 million guaranteed prize pool for which there was a $2.5 million-plus overlay. It was Colman’s ninth tourney cash of the year, seven of which have been final tables with three victories among them. Four of those final tables were in “high roller” or “super high roller” events, with a fifth in a $10K buy-in tourney from the WSOP this summer. 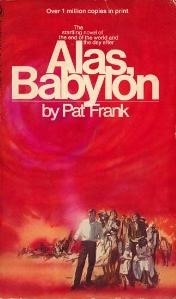 And of course he won the Big One for One Drop for a $15,306,668 prize. I believe with his win last night his total 2014 tourney winnings now add up to $21,058,153. Daniel Negreanu sits in second on the 2014 money list with more than $10.2 million, also thanks in large part to his big score in the Big One. Take those Big One cashes away from Colman and Negreanu, and Colman would still be well in front on the year’s money list with the $5.75 million he’s won in other events. Meanwhile on the “all-time” list -- which lost whatever small significance it might have had years ago -- Colman’s new total of $21,562,852 allows him to jump a few spots into third just ahead of Phil Ivey and behind Negreanu (first) and Antonio Esfandiari (second). Colman’s win last night culminates an interesting summer that saw him swiftly claim the poker spotlight in four rapid scenes. Winning the Super High Roller at the EPT Grand Final in April earned him some attention, with a few who didn’t already know about “mrgr33n13” -- who in 2013 became the first hyper-turbo player to earn more than $1 million inside a calendar year -- learning his name. 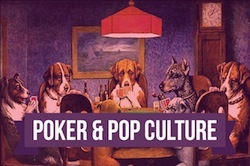 Then, of course, came the One Drop, the interview refusals, and the subsequent poker is “a very dark game” declaration that provoked a little bit of discussion about poker’s place in culture and a lot more about Colman himself. Then came the sloganeering by T-shirt at the EPT Barcelona Super High Roller final table which besides provoking various other debates about poker (and politics) seemed weirdly to contradict that earlier desire to remain unnoticed and without influence. Finally Colman’s victory last night over a large field in the SHRPO Main -- including outlasting a talented final table -- has evoked expected amazement at such a run of successes. It’s almost funny, in fact, to read all of the superlative-laden responses to Colman’s win and think about how they more or less serve to aggrandize his achievements -- that is to say, to do that which he spoke against in that angry “I don’t owe poker anything” Two Plus Two forum post and those “I don’t care about poker” tweets. Obviously “hero” isn’t the right word (on that I’d agree with Colman). But he’s certainly become an interesting, complicated character, caught somewhere between protagonist and antagonist among the cast in the current poker drama.